The suprachiasmatic nucleus of the hypothalamus is the master clock of the body. This small nucleus at the base of the brain orchestrates the daily behavioral and physiological rhythms of the human body that wake us up in the morning and put us to sleep at night. Until now, it was thought that these 24-hour sleep/wake oscillations were caused by the periodical changes in gene expression and electrical activity within the neurons of this clock nucleus as disrupting the activity of the clock neurons affects the sleep-wake cycles of experimental animals. However, new research from Michael Hastings' Group at the Medical Research Council’s Laboratory of Molecular Biology reveals a different type of brain cell may be important for regulating our sleep/wake timekeeping. This suggests that the timing of the clock is dependent on the activity of its astrocytes. Astrocytes are star-shaped glial cells that have classically been overlooked as the ‘support’ cells of the brain, but their integral role in brain processes such as memory formation are beginning to be understood. The team looked deeper into the mechanisms underlying their finding. Using organotypic culture methods, the team made explants of the clock nucleus from mice that express fluorescent proteins and reporter molecules in their brain cells. This special form of culture keeps the tissue alive and healthy for several days up to weeks, enabling long-term measurements of cellular activity. By imaging the cultured explants over the course of a week, the scientists monitored the slow 24-hour oscillations of the astrocytes and neurons and observed how their activity was in direct contrast to each other. The neurons were active during the day, whereas the astrocytes were silent. Conversely, astrocytes had a high level of activity during the night when neuronal activity was mostly silenced. Immunofluorescence image of the Suprachiasmatic Nucleus (SCN, labelled blue). 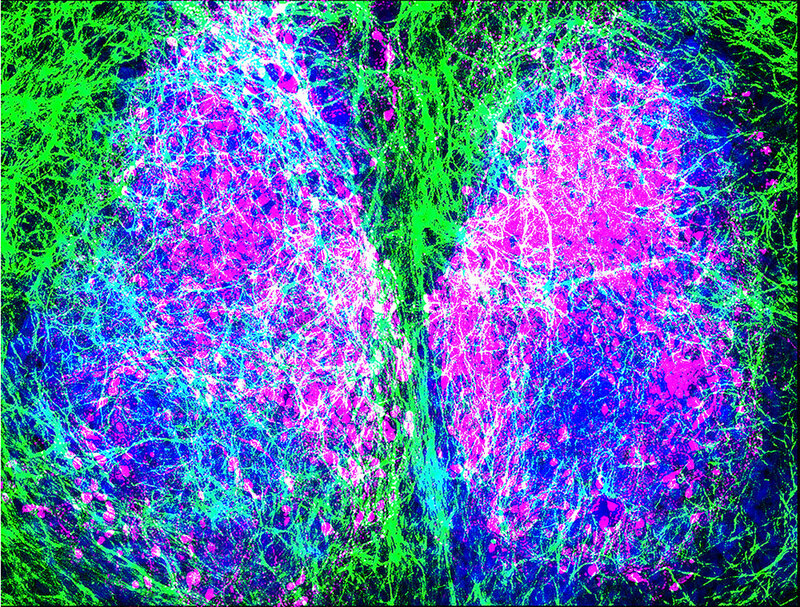 Astrocytes are shown in green and Neurons of the dorsal SCN in magenta. Hastings Group MRC LMB. The team wanted to understand the mechanistic basis for this reciprocal activity at the level of the receptors expressed in the cell membranes. As part of their assay the group looked at the signal from a glutamate reporter over several days. Glutamate is the most abundant excitatory neurotransmitter in the brain. And, given that the clock nucleus contains mostly inhibitory GABAergic neurons, the group were surprised to observe a signal in their explanted cultures. They were even more surprised to see the signal increased during the night. “We tracked the activity of a glutamate reporter over the course of several days on the plasma membranes of both neurons and astrocytes, and observed the largest glutamate signal during the night. This is the time when astrocytes are active.” Explains Dr Brancaccio. Looking in greater detail, the group showed that the subset of neurons expressed a certain type of glutamate receptor subunit, NR2C. These NR2C positive cells responded to glutamate which led to them inhibiting their adjacent neurons by releasing GABA. Further experiments confirmed that the NR2C positive cells were important for setting the circadian rhythm of the explants, but the question of where the glutamate came from remained. This indicated that glutamate release from astrocytes activated a subset of neurons in the dorsal region of the clock nucleus, revealing a microcircuit that could set the oscillatory rhythm of the sleep/wake cycle. This comprehensive investigation of body clock control by astrocytes from the level of the receptor up to the freely behaving animal underlies the importance of these cells in maintaining normal physiology.